We were retained by the National Trust to obtain planning permission, prepare contract documents and obtain tenders for the creation of a footpath to provide enhanced accessibility to Langdon Cliffs, as part of the “Up on the Downs, the White Cliffs Landscape Partnership Scheme – Landscape Action and Conservation Plan”. The path also forms part of the England Coast Path new National Trail. The requirement was to provide a level cross-section to the path and moderation of the steepest inclines to produce a more easily used path from the existing entrance to the grassland adjacent to the parking area, up to the first viewpoint summit. 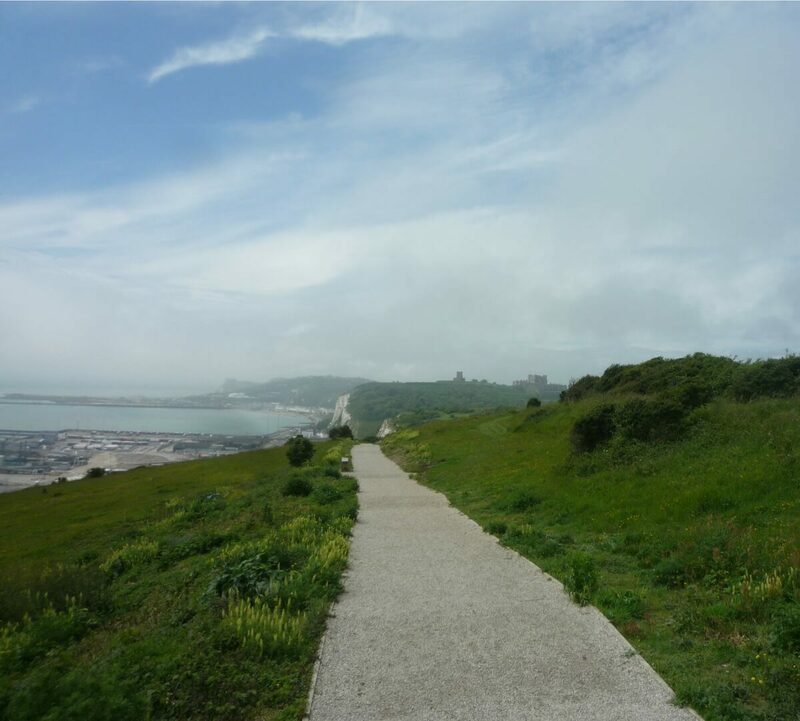 The route forms part of the Saxon Shore Way and White Cliffs Country Trail and provides dramatic cliff top views over the Port of Dover to France with Dover Castle an iconic feature seen above the town. The area is heavily designated being within the South Foreland part of the Kent Downs and Surrey Hill Area of Outstanding Natural Beauty, the Dover to Kingsdown Cliffs SSSI, Dover to Kingsdown Cliffs Special Area of Conservation and Heritage Coast. Various options for surfacing methods were assessed, together with their impact on the biodiversity of the SSSI and the potential for visual intrusion in the AONB. The route selected therefore followed the existing path route as closely as possible, to utilise areas already damaged and eroded, and minimise changes to the vertical alignment to avoid unnecessary cut and fill. The design of the path was intended to minimise erosion caused both by heavy use and by water runoff and materials were selected for their suitable ph and colour.